"Join us for an evening of tasty food and multimedia bicycle inspiration! 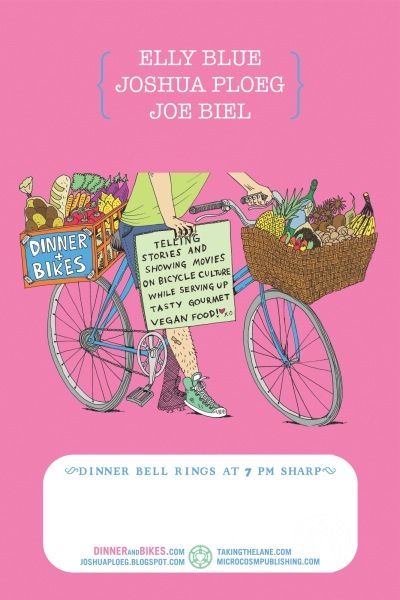 Chef Joshua Ploeg will cook up a gourmet vegan, gluten-free meal, which you will enjoy while taking in Elly Blue's inspiring talk about bike activism and a series of very-short films by Joe Biel. Afterwards, browse our pop-up bicycle/vegan themed book and t-shirt store, chat with the crew, and scheme up future bike fun." Tickets $12-20 sliding scale at the door.